The cost to move a toilet or sinks can be $2,500-$3,500 per fixture. Plumbing can be a significant cost factor in a remodel when a bathroom floor plan is altered. The toilet is the most expensive to move. Connecting the toilet to the existing sewer line can be a bit tricky for your plumber. The sewer-line depends on a slope. The sewer line pipes keep a specific slope to drain well. Another layer of complexity exists if the house is built on a concrete slab versus a raised foundation. Houses with a concrete slab foundation require concrete cutting to relocate new pipes. This can be more time consuming than a house with a raised foundation. The second consideration is the vent line that allows the sewer line to displace air with water. This vent line must be relocated to run within a wall, no further than 5’ from the toilet drain and vent through the roof. 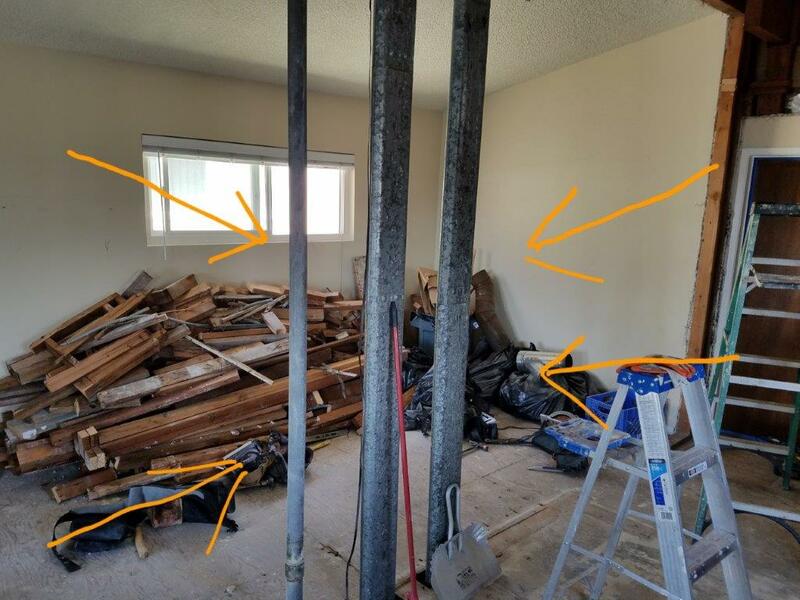 The cost of re-framing walls and repairing drywall can add to this cost. This cost could range between $1,500 and $2,500 depending on the extent of the work necessary. In the bathroom pictured below, we had to move the vent lines for the sink and install new drain lines connecting to the existing sewer lines. The sewer lines were on a different plane, and we had to get creative on the installation. Collectively, the costs can increase the bathroom remodel costs by 40%. Luxury plumbing fixtures can also make a dent in your bathroom remodeling costs. Faucet systems like New Port Brass add a level of luxury that requires a larger budget. Multi-function shower systems raise cost of the fixtures and may also cause you to upgrade to a larger water heater or to a tankless water heater. Bathroom remodeling requires the installation of tile. This is a leading factor in bathroom remodeling costs. Tile costs are heavy on labor; it takes about two weeks to properly tile a bathroom. The preparation work is typically four days, and the tile install is typically five days. In the attached picture, our Client wanted the vanity backsplash to extend from the vanity countertop all the way to the ceiling. Some homeowners opt to have tile installed on all the bathroom walls, 48” tall. Other Clients elect to have several walls completely covered in tile. These types of tile design can add a significant cost to the bathroom remodel. The cost of such designs can range from $5,500 to $7,500 depending on the tile and quantity of tile to be added. This article is not written with the intention to tell readers to install less tile. Simply stated, tile installation is a significant cost factor of the bathroom remodel and you should have your designer design towards a budget. Moving walls or altering walls is often necessary to make the bathroom larger and more functional. In some cases, installing a pocket door creates more usable space. 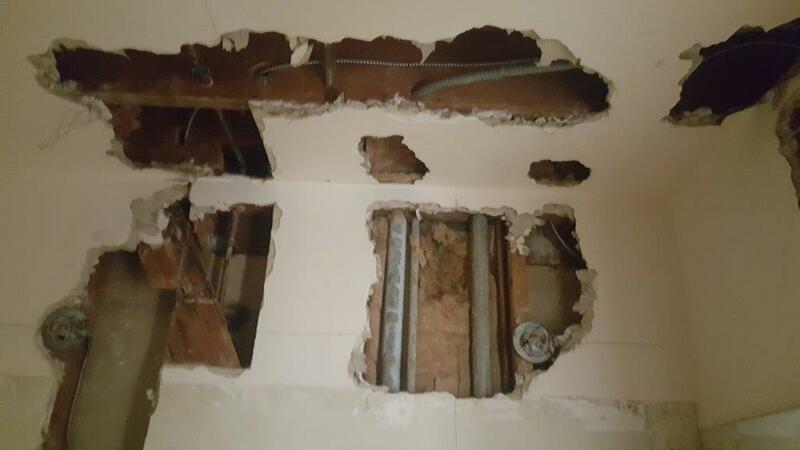 Walls often house vent pipes, electrical wires, heating vents and other infrastructure items that can be expensive to move. Moving walls may be needed to increase the footprint of the bathroom. The added function to the space may trump the expense. The cost of moving a wall can be as little as $2,000 or $8,500 depending on what needs to be relocated with the wall. If the wall is structural, add the cost of engineering, specialty hardware, and labor to retrofit foundations. The cost could elevate to $13,000-$15,000 depending on how much work is specified in the construction plans. The same can be said about the installation of a pocket door. For pocket door installation, the affected wall needs to be altered so that a void is created to house the pocket door. This means that existing electrical or venting that is within the needed footprint will have to be relocated to create a void for the pocket door to be installed. You can expect to pay $1,800 – $2,500 for a pocket door including the cost of framing, drywall, labor and the door. 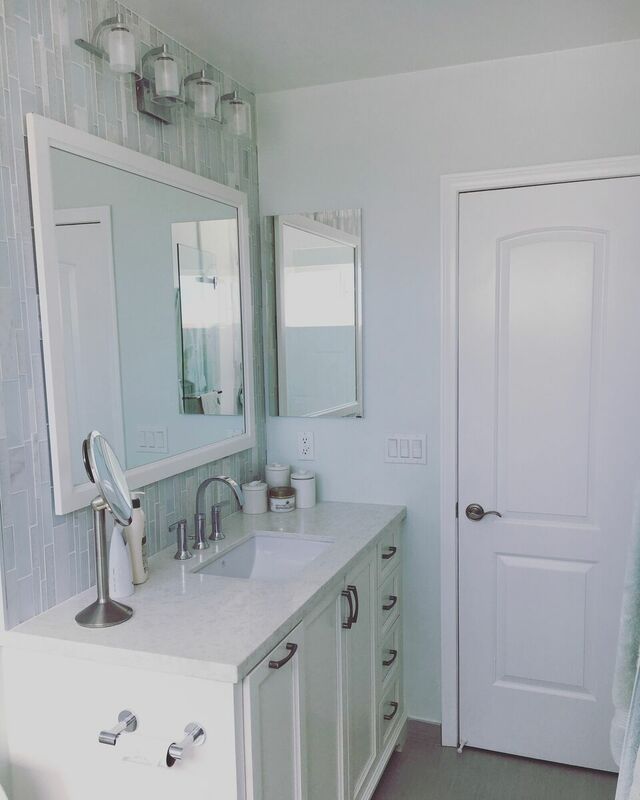 You have two choices for vanities, purchase a prefabricated vanity off the shelf or have a custom vanity built. 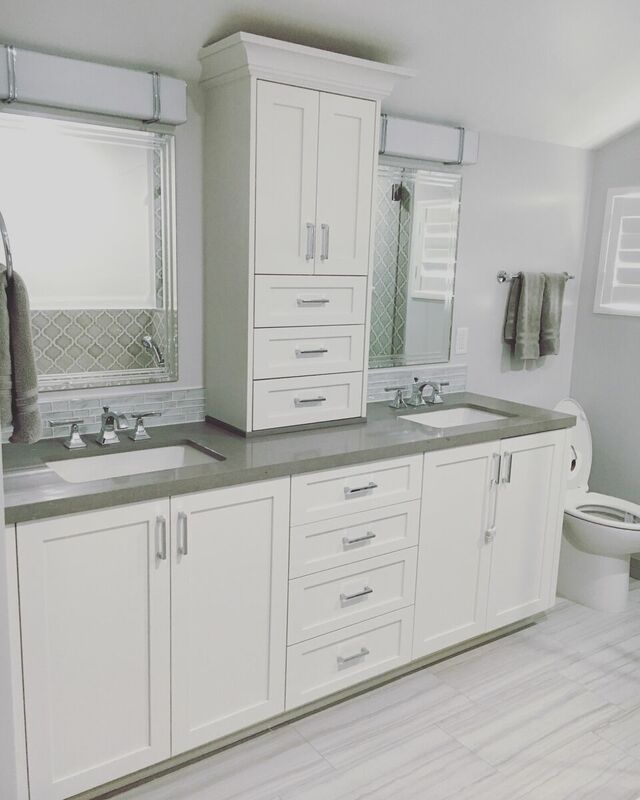 If you elect to have custom cabinets, you can expect to pay two to three times the cost of a prefabricated vanity. For perspective, a 6’ prefabricated vanity can cost $600-$850. A custom built 6’ vanity can be $1,800- $4500 depending on hardware and millwork options. A custom vanity is a specialized component of the bathroom remodel. It can be configured to house specific items and can also be made to be the focal point in the bathroom. A few years ago, we created the vanity pictured below for a client to match her grandmother’s bedroom drawers (Add Picture #4 and 4a). I handpicked the wood veneer and had the carpenter orient the wood grain as you see it in this picture. In this case, the vanity was a piece of art. This vanity was close to $6,000 and became a focal piece in the space. When it comes to the vanity, choose wisely because it is an essential component of a bathroom’s form and function.